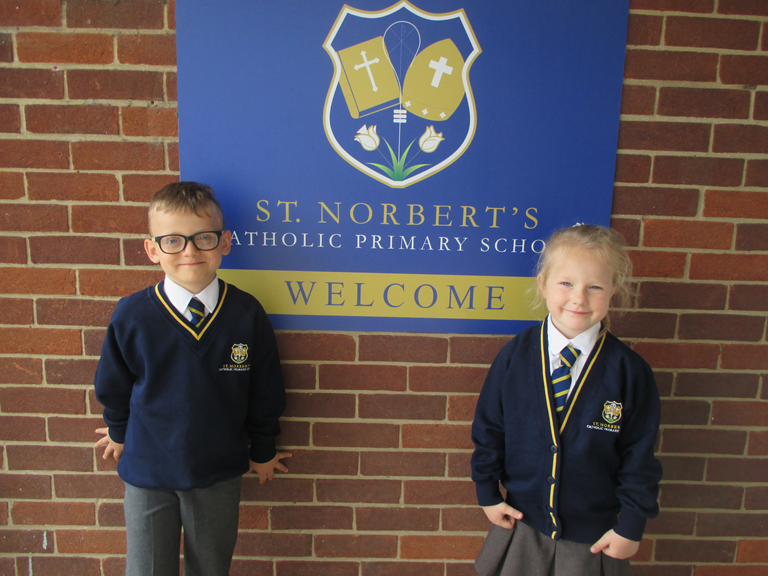 Saint Norbert's School uniform is ordered online from Uniform Direct. The only items available to purchase in school are ties at £3 for elastic tie and £4 for KS2 neck ties. Girls will be allowed to wear trousers if they choose to do so as part of the Winter uniform. Trousers MUST be plain charcoal grey and tailored. Bell-bottoms, slits, cargos and low waistbands are NOT allowed, as the trousers are part of a school uniform and not a fashion statement. Skirts are to be knee length. For PE, a school-badged navy T-shirt and navy shorts are needed, together with plimsolls. Trainers at Key Stage 2 are acceptable for netball and athletics. This equipment should be kept in school in a drawstring bag (obtainable from school).The may wear navy tracksuits in the winter. Grey or white socks are to be worn, grey tights may be worn as part of the winter uniform. Swimming costumes (one piece costume for girls) and swimming trunks (not shorts) for boys and towels should be brought to school when needed, and taken home on the day of use.The Governors do not allow children to attend school in ‘Doc Marten’ type boots or basketball-style trainers. Jewellery, other than a wristwatch and stud ear-rings, is not permitted. Earings must not be worn on days when the child has PE unless the child can remove their own earings. Dyed, shaved and ‘sculptured’ hairstyles are not acceptable; neat and tidy hairstyles are expected, with long hair being tied back Hair accessories should be simple and in keeping with school uniform colours – navy, blue, grey, black or white. Parents are asked in their own interests, to label every item of school clothing with their child’s name. During competitive sporting events, shin pads must be worn for both hockey and football. It is also recommended that they are worn during after school clubs and practice.